Are you a mental healthcare professional? Do you specialize in helping adult survivors of emotional child abuse or the power of words? Then The Invisible Scar would like to talk with you! The Invisible Scar is not a professional advice forum. It just starts the conversation regarding emotional child abuse and encourage adult survivors to seek professional advice. However, we often get questions that are better-suited to therapists, psychologists, and psychiatrists. If you are a mental healthcare professional, we’d like to either do a short interview with you or receive a guest blog post on a topic. At this time, we are unable to pay for interviews or guest articles, but we will provide a link to your website, publication, and a brief bio in the post. 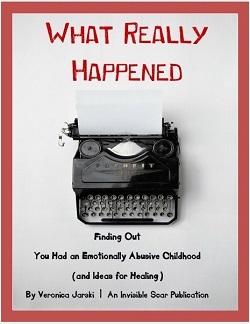 As an adult survivor of emotional child abuse, I related to several of these articles. I am LC in fact, very close to NC with my mother yet still feel some guilt around that. However, I do know it’s the best decision. As a Certified Health Coach, I frequently discover past abuse has been common among many of my clients. I can relate in my thoughts which is very helpful when it comes to understanding where they are coming from. The articles are well written. Thank you.